Tablet rivals set to fail unless pricing strategy changes, there are many new tablet PC’s coming to the market and pricing wars will happen, but many manufactures really needs to think its pricing strategy if they want any chance at all to compete with the Apple iPad 2. We had an email sent into us this morning giving an in-depth look into this, the graph below is very interesting indeed. The market continues to grow with new tablets being released frequently. As demonstrated in previous research, YouGov believes that Â£250 is the price point where the tablet market will take off. Tablets will fail to be a mass-market product until the price comes down to this price point. The research reveals low consumer consideration and expectation levels for a non-Apple brand. 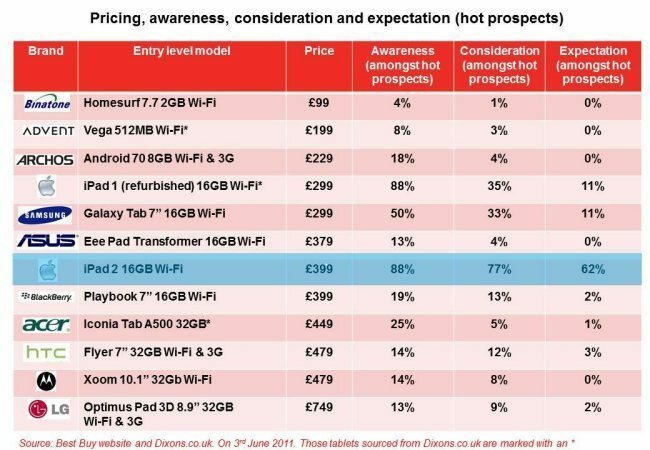 77% of “hot prospects” (respondents that are keen to get a tablet) will consider purchasing an iPad2 with a further 62% expecting to get one. However, the next most popular tablets are the out of date iPad1 and the Samsung Galaxy Tab both with expectation levels at 11%. Other competitors fared even worse, 3% of “hot prospects” expect to get a HTC, 2% a BlackBerry and just 1% expect to get an Acer (1%). This is the mountain Android based tablets need to climb. Feldman continues: “Google also need to change their strategy in the tablet market. The Apple dominated tablet market will be a hard challenge for most brands to overcome. Unlike the smartphone market, the Android models seem unable to challenge Apple and certainly won’t be leading the market anytime soon. YouGov’s TabletTrack study surveys tablet usage, attitudes and satisfaction, quarterly. The next wave of the tracker begins in August with a report due in September 2011. All figures, unless otherwise stated are from YouGov Plc. Total sample size was 3306 respondents, of which 1310 were tablet owners and 1996 nationally representative respondents. Fieldwork was undertaken between; the 6th to 12th May 2011. The survey was carried out online.